The Amati Family began Cremona's legacy of fine instruments, both by creating their own instruments and teaching a new generation of great luthiers. Andrea Amati was the founder of the Amati dynasty and is generally considered one of the first, if not THE first, maker of cellos, violins, and violas. Though Amati did not single-handedly create the modern violin family, he did establish and standardize the construction of many string instruments, including cellos. Almost nothing is known about him as a person, and what is known is gained from looking at his instruments and some scarce records. According to Carlo Bonetti, the author of several books on Amati and Stradivari, including A Genealogy of the Amati Family of Violin Makers 1500-1740, Andrea Amati was born between 1500 and 1505, becoming a master luthier by 1525. Many of his instruments were lost, perhaps due to orders from the Church to ban playing and destroy violins in parts of 16th century Italy. Many of his surviving instruments are from a commission made for Charles IX, the monarch of France. The group consisted of 12 large violins, 12 small violins, 6 violas, and 8 basses/cellos, though many were lost during the French Revolution. One of the oldest surviving cellos in the world, (maybe THE oldest), "The King", made by Andrea Amati, is from this group. Made in the mid-16th century, it is decorated with several 'fleur de lis', the symbol of French royalty, and 2 figures, representing 'piety' and 'justice'. It also has a 'K' on the side, standing for Karolaus, or Charles IX. It is thought that since this commission was so large, this cello was actually made before (as early as 1538) and then painted with French ornamentation to make it suitable for the royal court (around 1560). In 1801, it was cut down to modern dimensions by Sebastian Renault, a Parisian luthier. Previously over 790mm, it was cut down like many older cellos, including several early Stradivaris built based on Nicolo Amati's form. You can see the effects of this modification by looking at 'Justice', who is conspicuously missing her waist and left arm. Today, it is housed in the National Music Museum in Vermillion, South Dakota with 2 Andrea Amati violins and a viola. Hear cellist Keiran Campbell play Bach's 6th Suite on the 'Amaryllis Fleming' Brothers Amati cello circa 1600. Note that it's a five string cello. It's a smaller model or 'Piccolo' cello. And.. some attribute the work to Girolamo (Hieronymus) Amati alone. His sons Antonio and Girolamo inherited the shop, building instruments very similar to Andrea's. They worked together until 1588, when they fought and parted ways. Girolamo continued to make instruments under the 'Brothers Amati' label and Antonio made his own instruments. Today, many prominent musicians play 'Brothers Amati' Instruments. Including Sheku Kanneh-Mason, a 19 year old British cellist and the first black musician to win BBC's 'Young Musician of the Year' award, plays on a 1610 Brothers Amati cello. He first played the instrument, on temporary loan, in the final round of the BBC 'Young Musician' contest, and fell in love. Later, an anonymous sponsor bought the cello and gave it to Sheku on permanent loan. When he first received the cello in 2016, he said "I can hardly believe that I can continue to develop my relationship with this cello, making the sound more completely my own over time. This is a cello that will grow with me and respond to what I need to express". In 2018, he played his Amati cello at the royal wedding and was promptly named 'Cello Bae' by Twitter. Oh, Twitter. The next Amati in the line is definitely not the least talented. Nicolo Amati was the son of Girolamo Amati, and is considered the best maker of the family. Under his father's 'Brothers Amati' label, he attained great success and international renown. But in 1630, the plague killed both Nicolo's father and his main luthier competition, Giovanni Paolo Maggini. This outbreak of the Bubonic Plague was known as the 'Great Plague of Milan', and may have killed one million people. This left Nicolo as one of the only Cremonese luthiers and left his shop severely shorthanded. Nicolo was overwhelmed, forcing him to take on apprentices. This broke the Amati family monopoly and created a new generation of great luthiers including Andrea Guarneri, Giacomo Gennero, and Antonio Stradivari. 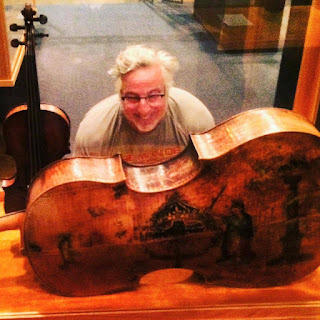 Though Nicolo's surviving cellos are rare, there are a few prominent examples. Ardal Powell has very detailed pictures of a beautiful Nicolo Amati cello, made circa 1680 on his website. Seriously, click the link and see those pictures! The 1630 'Vatican Stradivari' was a fascinating collaboration between several generations of luthiers. Contrary to its name, it was originally was made in 1620 by Nicolo as a 6-string viola da gamba. 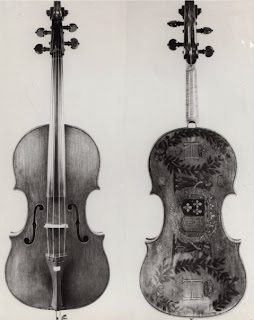 Stradivari later enlarged its upper and lower bouts, creating a cello. For 100 years afterward, it was played by musicians in the Sistine Chapel, giving the cello its name. In the 19th century, Georges Chanot, a Parisian luthier, finished the expansion and added some paintings to cover the traces. On the front are 2 angels, one playing harp, the other playing tambourine. On the back is the Vatican flag and papal hat with 2 dolphins on either side. Today, it is played by Swiss cellist Nadège Rochat. The last maker in the Amati family was Girolamo II (1649-1740), the son of Nicolo. He faced intense competition in Cremona from the Guraneris, The Rugeris, and an immensely talented student of his father's- Antonio Stradivarius. Eventually, Girolamo had left Cremona and settled in Piacenza. Wonderful cellist Jennifer Kloetzel plays a beautiful Girolamo Amati II cello, made circa 1701, both as a soloist and as a member of the Cypress String Quaartet. Jennifer says "I do know that the first few notes I played on the Amati made a huge impression on me. As if I had found a great match for 'my voice' (the cello sound in my head)." And a great match it is! If one Amati cello is wonderful, how about two Amati cellos in the Schubert Quintet? The Cypress String Quartert (with Jennifer Kloetzel playing her Girolamo Amati II cello, of course) recorded the Schubert Quintet with Gary Hoffman playing the other cello part on his Nicolo Amati cello. Probably the only recording with 2 Amati cellos! The Amati family played a significant role in the development and refinement of string instruments, and cellos are no exception. Although cellos are frequently overshadowed by violins, both in terms of historic examples and attention, they are certainly worth looking at. Are you a cellist or interested in becoming one? Take a look at our Fine Cellos.